Nook & Cranny was set up by Katie Aungles in 2001. Nook and Cranny is an agent working on behalf of individual property owners. Back then it was called Blue Sky Letting and it was a table top business which grew organically over the years at about the same rate as her 3 sons and enabled her to stay at home in West Bridgford with them after a more hectic career before that at KPMG, followed by 10 years at IBM. Originally it was a standard letting agency, and we still manage just a few hand picked high end properties in the area with standard 6 month ASTAs which are usually taken on being people who move their families to Nottingham from abroad, having been moved by their company. Then, in May 2013 we spotted what we thought might be a gap in the market providing short stay serviced apartments with one or two bedrooms in Nottingham which businessmen could come and stay in for periods usually between one week and a year. 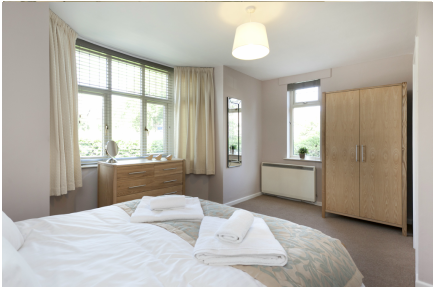 They are all fully furnished and serviced to a high level, so that they can feel completely at home instead of feeling like they are living out of a suitcase in an impersonal hotel in the city centre of Nottingham. Our initial feedback was excellent and remains today one of the great joys of the business - our guests tell us that they love to stay in these luxury flats in a community which lets them feel at home when every often their families are far away. Since 2013 we have increased the number of serviced apartments for corporate contracts, and we are always looking out for the latest property which will fit our guests requirements perfectly. We have gathered a lot of experience over the years and we are now pretty good at knowing which short stay apartment in Nottingham will delight our guests the most. Everyone who works with Nook & Cranny also lives in our community of West Bridgford, so we are proud to be able to give a real personal service and always enjoy going the extra mile for our guests if they need local knowledge about their particular interests, like good restaurants in West Bridgford, pubs which are welcoming and friendly, great run routes round the River Trent or Holme Pierrepont whether you are looking for under 5K or 10K and beyond we can help. We also have years of experience in helping people to move house and we love nothing better than to help people who are relocating to Nottingham to settle into the area. We have a fabulous housekeeping teams, - known by our regular guests as "The Pink Army" because of their beautiful uniforms - they are efficiently lead by Sarah who is always right there if people have any specific requirements. It is Sarah and her teams who make our short stay apartment in Nottingham sparkly and fresh, changing the bed linen and towels as well as waving their clean and tidy wands over all the flats weekly, so that you can relax and enjoy your stay. Our maintenance team comprises Steve on electrics, Martin on gas & pipes & Pete who does all things handy including safety requirements and between them they can cover just about anything that may go wrong and because they are all very local they can be on hand very quickly. The fabulous photographs that you see on the property pages are courtesy of John and the quirky video walk throughs are created by the wonderful lads headed up by Tom in West Bridgford. Sally has patiently helped me out with blogging and some of the website development whilst Jackie is in charge of Adwords & SEO. Cara does the finances so that Katie can take an overview of the whole thing and make sure that the guests are happy.